Talisman Dragon Pendant Silver - Clairvoyant COFFI - Dream Experiments . 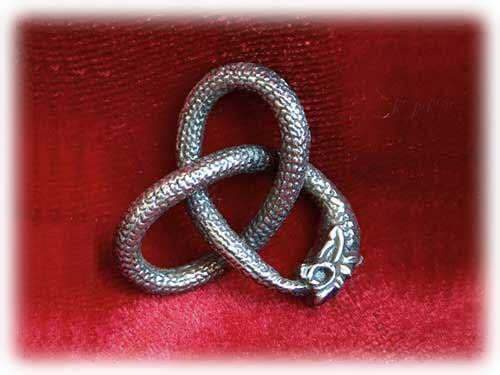 The Dragon pendant is a variation on the Gordian knot, it depicts an ouroboros dragonbiting his own tail. The ouroboros dragon is an ancient alchemy symbol that symbolizes the equality of the internal and external in the alchemist's soul. The Gordian knot can be made on a Torus tube which looks like a donut or a sphere that turns in from one side and comes out the other in a perpetual motion. The Torus Tube contains many mathematical formulas and equations. Science has begun using this model as a geometric\mathematical model of the universe. Sacred geometry also makes extensive use of this shape. The knot was made by Gordias. It was further prophesied by an oracle that the one tountie the knot would become the king of Asia. In 333 BC, Alexander attempted to untie the knot. When he couldn't find any end to the knot, he proceeded to slice it in half with a stroke of his sword (the so-called "Alexandrian solution").